The boys varsity hockey team kicked off their 2018-2019 season with their preseason trip, stopping at several New England colleges for their first practices of the season. 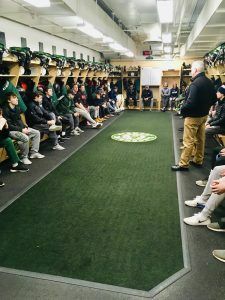 The first stop on their journey was the University of Vermont arena, home to the Catamounts and former Deerfield hockey player, Kevin Patrick ’88 who is currently the UVM Men’s Hockey Associate Head Coach. During their stay, the team had the opportunity to connect with and hear from Coach Patrick! 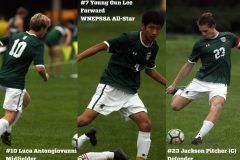 The team will return to campus after the Thanksgiving break and kick-off their season on the road at Roxbury-Latin on Wednesday, November 28th. 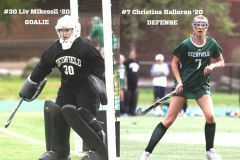 The Big Green will open their home slate of games on December 5th against neighboring NMH in the brand new Class of 1993 Rink housed in the new Deerfield Athletics Complex.